How do you make project decisions based on their impact on profit? 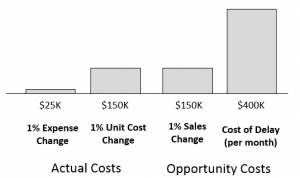 Here are some real world examples and how to calculate the impact of project decisions based on profit. Should we spend extra money to expedite something? Should we add a new feature and delay the project? Should we prioritize Project X over Project Y? At Playbook, we have worked with many companies to answer these and many other questions objectively, based on ROI and the cost of delaying a product launch (COD), using a simple economic model. In this example we explore the question would you spend $5K to expedite a part to save one day in your schedule? Intuitively would you guess that it was worth it? Analytically, is it? If one month of delay costs us $400K, then one week of delay costs us $100K, and one day costs $20K. In this example, you would be spending $5K and making $20K. The total net return is $15K. There is a 3-to-1 ($15K / $5K) Return on Investment in this decision. At first glance expediting the part seems prudent. However, if you could make 10-to-1 by investing that $5K somewhere else, for example toward more resources, or to accelerate another project, perhaps you make a different decision. This highlights the fact that ROI and COD should be considered enterprise wide. This is discussed further in example 4. Should we add a new feature which would delay the project? Let's say our new feature would add approximately 5% to sales volume, but delay the project by 1 month, and add nothing to unit cost. An increase of 5% sales volume would increase profit $750K (=5% * $150K/%). One month of delay costs us $400K. Omitting for a minute the cost of implementing the feature, we receive an additional $350K in profit with this decision. In making these decisions we are essentially making bets. A good payback is important even when we are betting with something other than project expenses . Sometimes we bet with our schedule, as in this example. We are betting that the month of delay cost we will incur will result in about a 5% increase in sales and a net return of $350K. We must expect to receive a good return on these bets, too. When a decision or change is ‘a wash’ and our net returns are low, we just waste time and energy changing plans. I know what you are thinking, "Confidence in an estimated sales increase?! When do you ever have that?" And, you are absolutely right. You don’t usually have great confidence in the exact value of how much any given change will increase or decrease sales. Fortunately, you don’t altogether need it. You can calculate the break-even increase needed, and often just be confident you are well above that. In this example, if you delay the project one month ($400K cost), you’ll need to increase sales 2.7% to break even ($400K / $150K). If we think the sales increase is in that ballpark, it is a ‘wash’ and we probably decide not to do it. But if we call and ask a few customers about it, and a few of them say “Yes I’d pay for that,” you probably have enough confidence in customer demand to make the decision to add the feature. This example considers the case of adding resources to a project. For this example, by using accurate live plans and having an understanding of resource criticality, we are able to estimate that adding 2 resources for 6 months would save us 1 month on the schedule. Launching one month earlier makes us $400K more, while the additional cost of resources is $200K (2 * 26 wks * 40 hr/wk * $100/hr.) There is payback, but it’s slim – the ROI is only 1-to-1. As such, it may not be worth spending the money on additional resources, if we can make more by investing it somewhere else. Lastly, let's say we are considering sharing a critical resource across two projects – Project X and Project Y. Project X is the example we’ve been using, with COD of $100K per week. Project Y is a cost-reduction on a currently-shipping product with a COD of $5K per week, (which is about average for cost-reduction type projects we see at PLAYBOOK). Project X is expected to keep our resource busy for another 6 months. Project Y expects to use our critical resource for 80 hours. Our resource’s availability to perform Project X work assigned to him is currently only 50%, 4 hours per day, after all of the meetings and interruptions and coffee breaks in an average day. 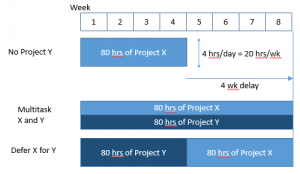 80 hours spent on Project Y will delay Project X by 20 days, or 4 weeks. This is true whether we multitask or not, as shown below. If we do Project Y we delay Project X by 4 weeks. Cost of Delay of Project X is $400K. If we defer Project Y until our critical resource is available in 6 months, we delay Project Y by 6 months (24 weeks). Cost of Delay of Project Y is $120K. Deferring Project Y makes us $280K more. To calculate ROI, if we say the $5K per week extra we are spending on parts in lieu of Cost Reduction Project Y is money we could invest in other projects or other decisions, the ROI on the decision is (400K-120K)/(120K) = 2.3-to-1. It's also very important to consider risks when making these calculations. In Example 1 above, how certain is it that expediting this one part would really save one day in our schedule? In Example 2, how sure are we that the feature will increase sales 5%? We can easily incorporate Risk into the analyses we run, and make fast, profitable, objective decisions in cases where there is uncertainty (and there is always uncertainty). Want to learn more about how to calculate cost of delaying your launch? Download the free eBook, How to Calculating the Cost of Delay.